Digital UltraViolet and Digital Copy will makes it possible for you to stream the movie Death Wish 2018 HD UV or iTunes Code instantly to your computer and compatible Smartphones, Andriod, iphone, iPod Touch, iPad and tablets devices anytime, anywhere. You can also download a Digital UltraViolet Copy or a Digital Copy of the movie Death Wish 2018 HD UV or iTunes Code to your computer and compatible devices. Bruce Willis as "Paul" becomes a vigilante. He gets those men. Death Wish (2018). MGM. Rated "R". Running Time: One hour, 47 mins. Remake of Death Wish (1974) starring Charles Bronson. In Chicago, Illinois, Doctor Paul Kersey (Bruce Willis), his wife, Lucy (Elisabeth Shue) and his daughter, Jordan (Camila Morrone) enjoy lunch at a restaurant. The crooked valet, Miguel (Luis Oliva), manages to get the Kersey's address from their car and takes a cellphone photo of it. On another night, the Kersey's were to go out and celebrate Paul's birthday, but he gets a sudden call from the hospital to come in to work. His wife and daughter are understanding and decide to celebrate tomorrow night. With Lucy and Jordan alone in the house, three masked men, Knox (Beau Knapp), Joe (Ronnie Gene Blevins) and Fish (Jack Kesy), invade the house and Lucy and Jordan are attacked. Injured, they are sent to the hospital. Paul is told his wife has died. His daughter is in a coma. Since the detectives are not able to find the criminals, Paul becomes a vigilante with a gun and decides to find the men himself who killed his wife. Also in the cast: Vincent D'Onofrio, Dean Norris, Kimberely Elise, Len Cariou, Wendy Crewson, Mike Epps, Ian Matthews, Kenny Wong, Stephen McHattie, Stephanie Janusauskas, Anoulith Sintharaphone. Bruce Willis was the age of 61 during filming. Filmed in Chicago, Illinois. Lachine and Montreal, Quebec, Canada. In-film advertising: Apple, Subway, 7-UP. Bruce Willis is the perfect choice in the lead of this "Death Wish" remake. 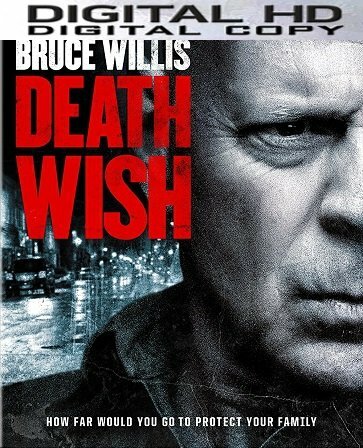 I hope Bruce will return for more "Death Wish" movies and a "Die Hard" movie too. I will review the DVD when I see it. Death Wish (1974). Death Wish II (1982). Death Wish 3 (1985). Death Wish 4: The Crackdown (1987). Death Wish V: The Face of Death (1994). Death Sentence (2007). Starring Kevin Bacon. Death Wish (2018). Starring Bruce Willis. Also see Death Kiss (2018), if released, starring Robert Kovacs (whom resembles Charles Bronson).